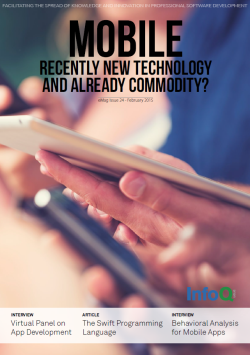 InfoQ Homepage Guides Mobile - Recently New Technology and Already a Commodity? from 100 locally-based editors across the globe, we continue to build localized communities. Enjoy presentations, interviews, news and articles curated by practitioners just like you. We're facing new generations of mobile devices like wearables and the multitude of mobile gadgets that make up the Internet of Things. We will be confronted with new types of user interfaces for displaying data as well as accepting commands. And we will see more and more companies really going mobile first. All this will influence the way we design, develop and test software in the coming years. There are numerous ways of writing a mobile app these days - none of them is the wrong one or the right one one. There are various aspects related to existing development stacks that may influence the decision of whether to use one approach or another. This eMag discusses some familiar and some not too familiar development approaches and hopefully will give you a helping hand while defining the technology stack for your next mobile application. But it’s not only how we build features for our mobile apps, it’s also about what features to build. Mobile apps - on smartphones and soon also in a great number of wearables - are the most personal channels to our users, our customers. We need to think carefully what experience to offer so users will stick to our apps. For this eMag we reached out to practitioners and vendors of tools and services. And we got back opinions and experience of the people that influence the mobile space. Behavioral Analysis for Mobile Apps - Mobile channels are getting more and more important - not only for companies with focus on technology but also for traditional businesses. Consequently, the concepts of website optimization and customer behavior analysis are being transferred to field of mobile websites and mobile applications. The overall goal is to learn more about customer behavior and to adopt mobile applications to it. Unusual Ways to Create a Mobile App - There are hundreds of thousands of mobile applications for nearly every purpose in the iOS or Android app stores. In this article we would like to show you two not so common ways to build native apps with Java and Xtend which help to share code between both worlds and simplify development. The Swift Programming Language - In 2014, Apple surprisingly unveiled Swift, a new programming language for iOS and OSX at WWDC. Swift is an alternative to Objective-C introducing syntactical concepts and programming paradigms well known from other languages but not available in iOS and OSX world yet. In this article, Gustavo Machado, vice president of engineering at KidoZen, details why Swift is an enrichment to iOS and OSX. Merry Swiftmas from InfoQ - This article teaches you to create as many trees and presents as you need on your iOS device using Apple Swift and SceneKit. SceneKit is a 3d-graphics-framework often used for gaming projects and obviously sometimes to create Christmas accessories. Merry Swiftmas!